Here we are, into the first few days of the winter season and already I'm talking about a trend featured for next spring. 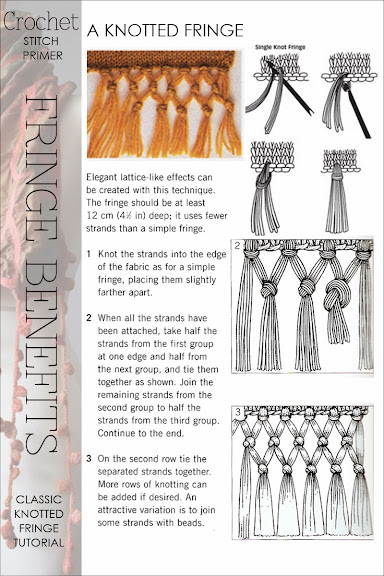 Well, here's a reality check, fringes are not new. Trends are recycled and repackaged. Some hang around for quite a few seasons and others, mercifully, die a quick death. 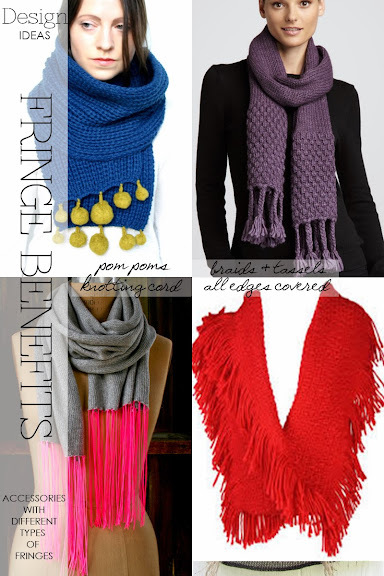 Ordinary fringes on the bottom of a scarf are boring, been there done that. 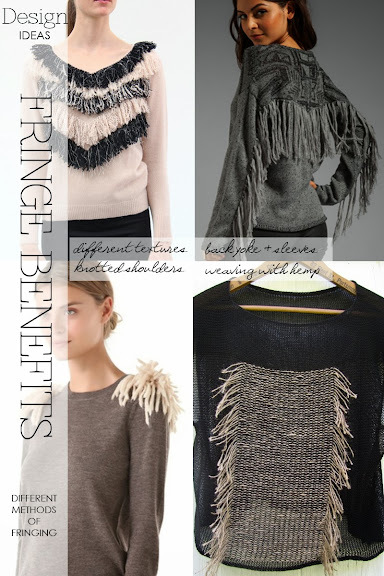 Now, leather or suede fringes on a knitted garment is interesting creating a boho vibe that is currently so popular. Think tufts of fringes here and there, not necessarily in even lines. Starting with a plain, flat base mix textures using bouclé, sheer tape, eyelash and metallic fringe. This mix creates excitement in the design, much like mixing patterns or colour blocking. A thick roving yarn randomly knotted on the shoulders lends a dishevelled, military feel simulating epaulettes. 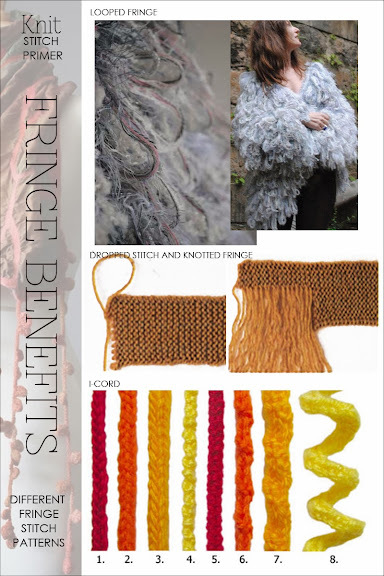 The design possibilities are endless as are the types of fringe patterns and materials to make them. 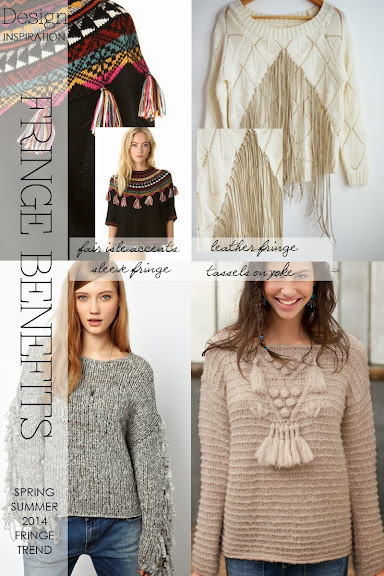 Read on and be inspired by designs featuring different ideas for fringes and how to use them. 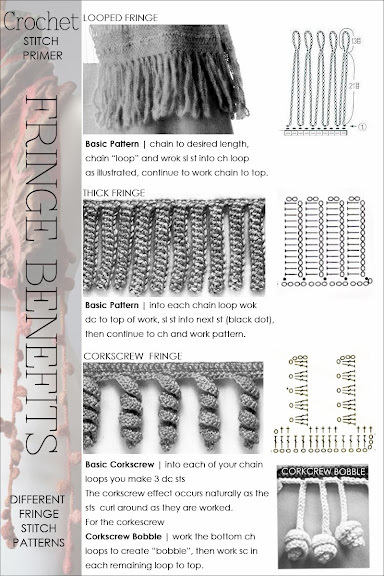 For crocheters there are several novel patterns to try.